Nancy Durham on the man who survived an Iranian prison by singing Leonard Cohen songs. 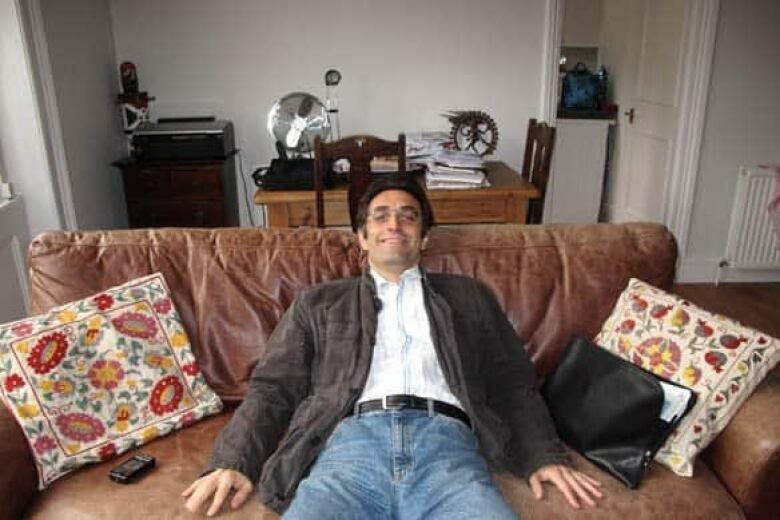 Maziar Bahari, an Iranian-Canadian journalist and filmmaker, was on assignment in Tehran in June 2009, covering the Iranian election for Newsweek magazine. During the post-election turmoil he was arrested by members of Iran's Revolutionary Guard and taken from his mother's home to Tehran's Evin prison where he was incarcerated, interrogated harshly and threatened with execution for 118 days before being released on Oct. 17, following international appeals. Evin prison was where Canadian freelance photographer Zahra Kazemi was beaten and died from her injuries in 2003. An acclaimed filmmaker, Bahari emigrated to Canada in 1987 and studied at Montreal's McGill and Concordia universities. He currently lives in London, with his wife Paola Gourley and their new baby Marianna, where he met with the CBC's Nancy Durham. Maziar Bahari's outward appearance belies the fact that he spent four months being slapped, punched and kicked by his Iranian interrogator, a man Bahari calls Mr. Rosewater after the scent of his cologne. Funny, charming and easy mannered, Bahari is also someone who notices life's little details. If you are looking for someone to write a handbook on how to survive an Iranian prison, it would be hard to find a better guide. In his case, he used his dreams, imagination and, at one point, the lyrics of Leonard Cohen to navigate his way through this nightmare. At his first interrogation, through a gap in his blindfold, Bahari glimpsed Mr. Rosewater's comfortable slippers and took this as a sign that his interrogator was settling in for a long assignment. But, a resourceful prisoner, Bahari soon found a way to take some control of the situation, at least in his own mind. "I knew I had to create this parallel space for myself, a parallel universe that he could not penetrate," Bahari told me last week. The initial beating left his skin feeling like it did "the time I was in Cape Town, South Africa, when I slept on the beach and woke up three hours later and my body was burning. "So while he was beating me I was thinking about Cape Town and the ocean and, you know, being on the beach." As the days wore on, however, memories of Cape Town were not enough. He needed something more lasting. Bahari suffers from migraines and his captors had allowed him to retain his medicine. One night, after a particularly hard beating, he took several pills. "I knew it was bad to take all those pills but I thought I cannot deal with this pain." And, in the end, salvation followed in the form of a dream. In it, two women who reminded him of his late sister appeared. "I asked them 'Who are you?' and they said 'We are sisters of mercy' and all of a sudden I heard Leonard Cohen's song, Sisters of Mercy, and when I woke up I felt much better about myself." In Bahari's waking hours he did not let go of his imaginary visitors. "All of a sudden this universe was created, this universe that was guarded by Leonard Cohen and it was just ridiculous to me that this old, Jewish, and one of the most cynical poet-songwriters in the world managed to save me in the heart of the Islamic republic." As it turned out, when he lived in Montreal, Bahari's place was near Cohen's home, "so maybe that's why Leonard Cohen came to my dream and saved me. "Of course, there was also his lyrics. He's always been one of my favourites." Cohen brought salvation, in the form of someone Bahari could listen and talk to in his imagination. But then something rather more tangible entered his universe. Just before he was arrested, he had appeared on the The Daily Show with Jon Stewart as part of a spoof interview that had been filmed in Iran. "One day my interrogator told me that we have video evidence of you working as a spy and I thought to myself what can be the evidence? "Then when he put the DVD of the Daily Show in the laptop I just thought 'Oh my God, they cannot be that stupid.' But they proved to be that stupid." In the skit, Bahari is called Agent Pistachio, someone who supposedly coordinates all the Western journalists in Iran. "I told my interrogator, 'I hope you're not suggesting that he's a real spy' and he said 'Well he looks very suspicious and why should he pretend to be a spy? Why should he choose you for an interview?'" Meanwhile, back in London, Bahari's wife, lawyer Paola Gourley was campaigning hard for his release. She was determined to have him home for the birth of their first child, which was due on Oct. 26. I first met her in July, a month into his incarceration, and marvelled at her composure as she gave interview after interview in defence of her husband. Like Bahari, Gourley was able to stay focused on her mission — to be reunited for the baby's arrival. When we met again last Friday, one month after her husband's release from prison, she explained how she managed. The trick was not to lose sight of the ultimate goal, she said. "Otherwise, I would have been more likely to get depressed and down and that would have served no one well at all." During his incarceration, Bahari feels he knew exactly when he realized the campaign was working. "The best moment for me in prison was when my prison guards started to call me Mr. Hillary Clinton because Hillary Clinton, the secretary of state, had started to talk about my case." I joined the couple on a train journey to visit family and watched them cart around month-old Marianna with all the paraphernalia that accompanies a newborn child. Looking on, I thought how normal things now look but how differently it might have turned out. Bahari knows, too, how lucky he is. Without the high-profile campaign that was waged for his freedom by diplomats and prominent politicians, he might not be here. As the train flew across England's autumn landscape he looked down at Marianna and remarked, "I have all these mixed emotions now. "I really feel happy and fortunate to have Paola and to have my baby, but at the same time there is something inside me that is really sad for the people that I left behind in Iran, people who are still in prison in Iran. "They are not as lucky as I am. People outside of Iran don't know their names, they are just faceless names and, I think, that in the future I have to use this momentum that I have now to ask for their release and to campaign on their behalf."